Where you can eat in Domain of Versailles? Eat Sandwiches on a bench is tolerated. Picnic is allowed in the Domain of Versailles. Find the area of picnic in Park of Versailles’ Palace on the locator map. Not to carry your picnic too far, I recommend you to park at Parking Boulevard de la Reine, it costs €6 for a day and it’s near the Grand Canal. Find Salon de Thé Angelina on the locator map. Restaurant, tea room with sweet and savoury dishes and snacks all day. Price: from €16 to €26. Pastries, Macaroons and small cakes for tea time from €4,5 to €10. Find Le Grand Café d’Orléans on the locator map. Ladurée shop (macaroons), Parisian pastry shop, range of delicatessen: jams, teas, coffee, macaroons. Find Brasserie de la Girandole on the locator map. Find Parmentier de Versailles on the locator map. * From November to March: Allée du Bosquet des DômesPotato toppings cold or hot to takeaway. Price : between €5 and €8. Find Buvette du Dauphin on the locator map. Find La Flottille on the locator map. Restaurant in 1900 style, brasserie, tea room and takeaway inside or outside, near the Grand Canal. Menus: €27,50 (main dish + desert), €29 (starter + main dish), €35 (starter + main dish + desert). Price: starter at €12,50, main courses (fish and meat dishes) at €21, desert at €9. Find La Petite Venise on the locator map. Open every days from 10h30 a.m. to 6 p.m.
Average price for the restaurant menu : €30-50. Find Les terrasses de la Petite Venise on the locator map. Find Brasserie du Musée on the locator map. 2 place Gambetta (near from Versailles’ Palace, in front of Versailles’ Opera). Open from 11:00 a.m. to midnight. Takeaway in a terrace: lemonade and crêpes (french pancakes). €26 [starter + main course + cheese or desert + coffee]. Tickets to visit Palace of Versailles are sold in the restaurant. Find Le Saint-Julien on the locator map. Opening from tuesday noon to saturday night. Menus: between €12 and €30. Find La Veranda on the locator map. €69 [starter + main course + desert]. Find Gordon Ramsay on the locator map. Menus [starter + main course + desert]: €90, €143, €193. This page provides information and advice on everything you have to know before visiting Palace of Versailles with kids. Palace of Versailles is a great monument visited by a lot of tourists, so you have to be organize before coming. What to you want to see? You have few possibilities which depends on what you want to see with your kids. If you only want to visit the Versailles’ Palace, you should come in the morning (at 9:00 AM) or at 4:30 PM to avoid the crowd. If you only want to visit the Versailles’ Palace and Gardens in 1 day, you should visit the Palace in the morning (at 9:00 AM) or at 4:30 PM to avoid the crowd, and walk in the Gardens and the Park the rest af the time. I prefer going to the Palace in the morning, so that kids can run in the park after being so kind and quiet during the visit; it’s like a reward. If you want to both visit Versailles’ Palace, the gardens and Trianon Palace and Marie-Antoinette’s hamlet in 1 day, you can organize your day that way : See the interior of the Palace at 9:00 AM, than gardens and park, and after Trianon palaces and Marie-Antoinette’s hamlet (open until 5:30 PM, 6:30 PM in high season). I advice this plan, because kids can romp in the park before moving on with a new tour. When you choose what you want to visit, buy your tickets through Internet to avoid a long queue on site. You have to reserve for adults, but it’s free for kids until 18 years old and for European Union residents under 26 (student card). To benefit, don’t forget your proof to show it at the main entrance. The price of your ticket depends on what you want to visit. For information, even if you have a ticket entrance for the Palace of Versailles, you will queue to the Palace main entrance (named A) to pass the control. How many time do I need to visit? For visiting the Palace of Versailles with kids, you need at least one hour and half. At the entrance, you can have audioguides with explanations specially adapted for kids, but only in french. The audioguide is free, it’s included in the price of the ticket. The adults’ audioguide exists in 11 languages. Officially, the audioguide is available for kid from 8 years old, but kids really appreciate to have one even if they don’t fully understand. You can also visit with a Guided tour. It costs 7€ for adult in addition to the admission price. Admission is free for children under 10 years old. For Gardens and the Park, it depends on your legs and your kids! You can stay as long as you want until the closing 6:00 PM (8:30 PM in the summer). For Trianon Palace and Marie-Antoinette’s hamlet, you need one hour and a half. Be careful ! Pushchairs and baby-carriers with metal frames are not allowed in the rooms of the Palace. You should bring a baby sling or a baby-carrier without metal frames for children under a year old. You can go to Palace of Versailles without a reservation, but you will wait for a very long time (few hours), and with kids it could be awful. My best advice : reserve before coming ! Where book or buy a ticket in Versailles ? Ticketing’s Palace of Versailles. You could also buy it in Palace of Versailles but you will queue more than 1 hour. By Internet Palace of Versailles’ partners : Digitick (€15 + €1,45 to book), FNAC (€16.80 + €0,50 for delivery) and Ticketmaster (€16,80). Guidatours : this tourist agency located on the way between Versailles Rive Gauche Station and Palace of Versailles sells ticket. If you book by Internet or buy in law season (November to March) the ticket price is sold at the same price as in Palace of Versailles. You just have to remove locally with your email confirmation. 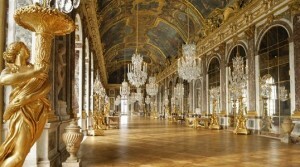 In high season (April to October) : Ticket for Palace of Versailles’ visit + €2. Tourist office (Office de tourisme) : Ticket for Palace of Versailles’ visit + €1,5€ / Passport + €2. Town center of Versailles, in coffee shop and restaurants (You don’t have to consume) sign by a posters outside. The ticket is sold at the same price as in Palace of Versailles, it’s valid for 2 years. Be careful, they could be out of tickets or do not sell in low season (November to March). Good news : it’s free for kids until 18 years old and for European Union residents under 26 (student card). Be careful, don’t forget your proof to show it at the main entrance. And Guided tour is free for children under 10 years old. 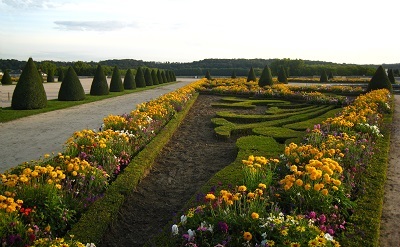 The domain of Versailles is free on the first Sunday of every month from November to March. I avoid this specially day : it’s free but there are too many people. Queue is very long and it may take several hours before visiting, after that time kids are very upset. Palace ticket allows you to visit the Palace of Versailles. The price is €15 for adult / free : 18-25 years old (student card proof) and 0-18 years old. Passeport ticket lets you access anywhere at Versailles. It costs €18. Be careful : on the days of the Musical Fountains and Gardens shows (week-end from 1st April to 31th October), it costs €25. 2-days Passeport ticket allows you to access anywhere at Versailles over 2 consecutive days. It costs €25, or €30 on the days of the Musical Fountains and Gardens shows. 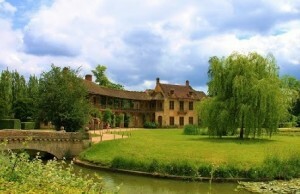 Trianon Palaces and Marie-Antoinette’s hamlet ticket entitles you to admission to those places only. The price is €10. Musical Gardens (Jardins musicaux) : €8 for adult [free for kids under 5 years old]. 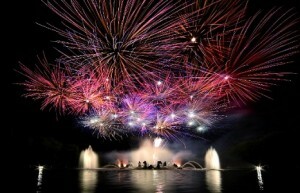 Fountains Night Show (Grandes Eaux Nocturnes) : €24 for adult / €20 for kid. Combate Ticket Serenade + Fountains Night Show (Grandes Eaux Nocturnes) : €36. Admission to the Park and Gardens of Versailles is free for pedestrians but there is a fee for vehicles: €3 for a motorcycle, €6 for a car and €30 for a bus (from 12 seats). Guided tour cost €7 for adult in addition to the admission price. Admission is free for children under 10 years old. During the Summer (from April to October), the Domain of Versailles organizes events that may interest you and make your visit more special and memorable. 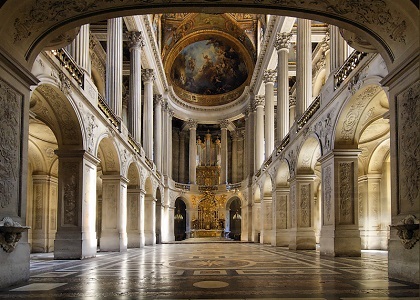 Domain of Versailles invites artists to reinvent the spirit of the Grand Siècle of Louis XIV. Discover the Musical garden, Musical Fountains Show, Fountains Night Show and the Serenade. You can stroll through the Palace of Versailles’s gardens designed by André Le Nôtre with music that comes from green spaces (groves). It’s a quiet and pleasant moment with the sound of Baroque music. Be careful : tickets are not returned neither exchanged or refunded even in bad weather on the day. Music in the Gardens takes place whatever the weather. It happens each Tuesday, from April to October. From 10: a.m. to 6:30 p.m. It costs €8 and it’s free for kids under 5 years old. In green spaces (groves), water flows in the basins against the backdrop of Baroque music. The Musical Fountains Show takes place every Saturdays and Sundays from April to October. It’s a magical walk through the gardens and fountains highlighted and music, ended with a fireworks display on the Great Canal. According to me, it’s a wonderful spectacle that will please the whole family. A show you should not miss ! Each Saturdays evening, from mid-June to mid-September. From 8:30 p.m. to 11:00 p.m. (2 hours and half). It costs €24 for adults and €20 for kids. Just before Fountains Night Show, musicians and dancers show you in the Hall of Mirrors (Galerie des Glaces) for a French ball. Each Saturdays from mid june to end August. Two performances of 50 minutes at 6:45 p.m. and 7:45 p.m. It costs €36 for a combate ticket Serenade + Fountains Night Show (Grandes Eaux Nocturnes). What are the opening times ? The Opening times are longer in high season (April to October) than in low season (November to March). Palace of Versailles is open from 9:00 AM to 5:30 PM (6:30 PM April to October) ; last admission 5:00 PM (6:00 PM November to March), from Tuesday to Sunday. Trianon palaces and Marie-Antoinette’s hamlet are open from noon to 5:30 PM (6:30 PM April to October) ; last admission 5:00 PM (5:45 PM April to October). 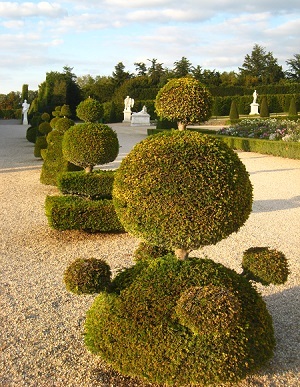 French gardens are open every days from 8:00 AM to 6:00 PM (8:30 PM April to October). Park and Gardens are open from 8:00 AM to 6:00 PM (7:00 AM to 8:30 PM April to October). How many days at Palace of Versailles? This page provides tips to get out how many days at Palace of Versailles you need to cover all you want and hints to help you to plan your holidays. Is a half day enough or 2 days are necessary? 1. When do I go there? Do I want to visit Palace of Versailles at the lowest months and days? If yes, I come from November to February and I prefer Wednesday or Thursday. Do I want to visit free Palace of Versailles? I come the first Sunday of the month, from November to March, because it’s free. I don’t forget that I will queue for more than one hour! Do I want to see Musical Gardens or Fountains Night Show? For Musical Gardens, I come Tuesday from April to October. For Musical Fountains Show, I come Saturday or Sunday from April to October. For Fountains Night Show and Serenade, I come Saturday evening from mid-June to mid-September. For these special events, don’t forget to book before! Do I want to walk free in the Gardens? I come November to March. I come Wednesday, Thursday or Friday from 1st April to 31th October. Be careful you will have to pay every Tuesdays, Saturdays and Sundays on these months. Back to top of How many days at Palace of Versailles ? 2. What do I want to see ? For Palace of Versailles + gardens + Trianon palaces + Marie-Antoinette’s hamlet: in 1 day it’s possible, but 2 days is better. 3. How to organize my day? If I want to see Palace of Versailles or the Gardens? I visit the Palace in the morning (at 9:00 a.m.) or at 4:30 p.m. to avoid the crowd. I walk in the Gardens and the Park when I want. If I want to see both Palace of Versailles and the Gardens in 1 day? I visit the Palace in the morning (at 9:00 a.m.) and after I walk in the park, so that kids can run after being so kind and quiet in the palace. If I do the opposite, I see the Palace from 4:30 p.m. to avoid the crowd. If I want to see both Palace of Versailles, the Gardens and Trianon Palace and Marie-Antoinette’s hamlet in 1 day? First choice: I see the interior of the Palace at 9:00 a.m., than Gardens and Park, and after Trianon Palace and Marie-Antoinette’s hamlet (open until 5:30 p.m., 6:30 p.m. in high season). It’s my preferred choice, because kids can romp in the park before moving on with a new tour. 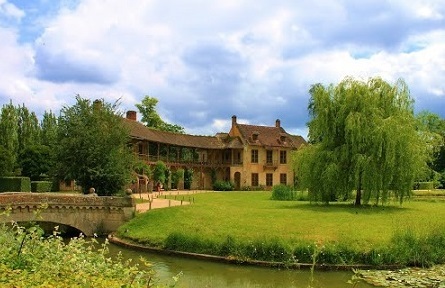 Second choice : I begin by gardens and park until 12:00, than Trianon palaces and Marie-Antoinette’s hamlet and I finish by the interior of the Palace after 4:30 p.m. I well know my kids and I imagine if they will want to visit all or only the palace. I have to decide before buying tickets, because the price won’t be the same and I don’t want to queue! Have a look at the Palace of Versailles Opening Times to choose your best moment to visit. If I want to see both Palace of Versailles, the Gardens and Trianon Palace and Marie-Antoinette’s hamlet in 2 days? The first day, I see the interior of the Palace at 9:00 a.m., than Gardens and Park. If I do the opposite, I see the Palace from 4:30 p.m. to avoid the crowd. The second day, I begin by Gardens and Park, and I visit Trianon Palace and Marie-Antoinette’s hamlet from 12:00. 4. How busy is Palace of Versailles? Have a look at the Palace of Versailles attendance Page to choose your best day to visit. 5. 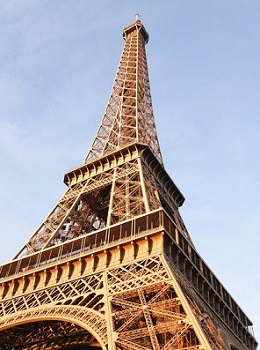 Do I want to see some Paris attractions like Disneyland Paris or the Eiffel Tower? If yes, I could spend some more nights in Versailles hotel or move in another hotel. Have a look at all the possibilities around Paris and not so far from Versailles. 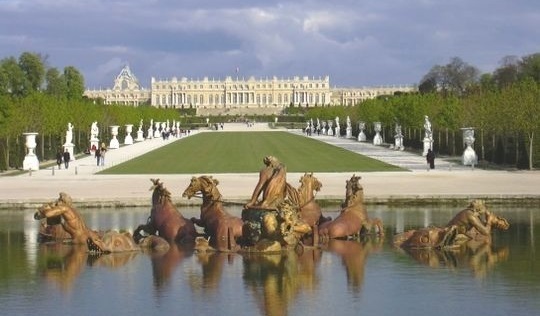 The Versailles’Palace is one of the UNESCO’s World Heritage List. It is very famous, not only for its beauty but also as a symbol of absolute monarchy of the Ancient Regime. In the 1660s, the young king Louis XIV began to transform the hunting castle of Louis XIII. The architect was Louis Le Vau. 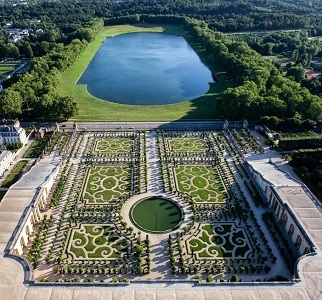 André Le Nôtre begans to create « French-style » Gardens of Versailles. In 1678, Louis XIV, named « Sun King », decided to expand the castle into a Palace. The architect Jules Hardouin-Mansart created the Hall of Mirrors, decoreated by the painter Charles Le Brun. 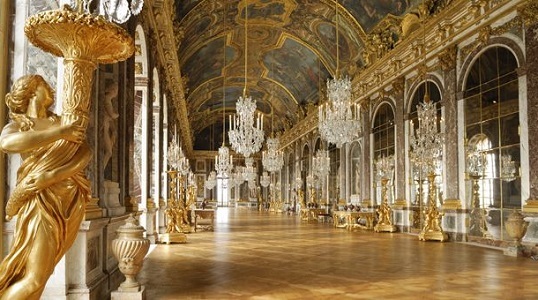 The famous Hall of Mirrors was a waiting and meeting place where the King showed his royal power to impress visitors. In 1682, the King moved the court and the government of France from Paris to Versailles. In 1837, Louis-Philippe converted it into a museum of French History. In 1919, World War I ended in Hall of Mirrors with signing the Treaty of Versailles with Clémenceau (France), Wilson (Uned States), Lloyd George (United Kingdom), Orlando (Italy), Müller and Bell (Germany). Museum of French History : paintings and sculptures which show the great national history of France since the Middle Ages.